Seeking to bolster its reputation of being inclusive, the city of Boston will post 50 signs aimed at diffusing Islamophobia. The public service announcement campaign was announced Monday by Mayor Martin J. Walsh’s office, and comes after San Francisco’s Bay Area Rapid Transit system did something similar. Starting Monday, the posters will be placed throughout Boston on public furniture — such as bus stops — over the next two weeks. The posters, designed by the artist known as Maeril, gained popularity online after the November 2015 terror attacks in Paris. 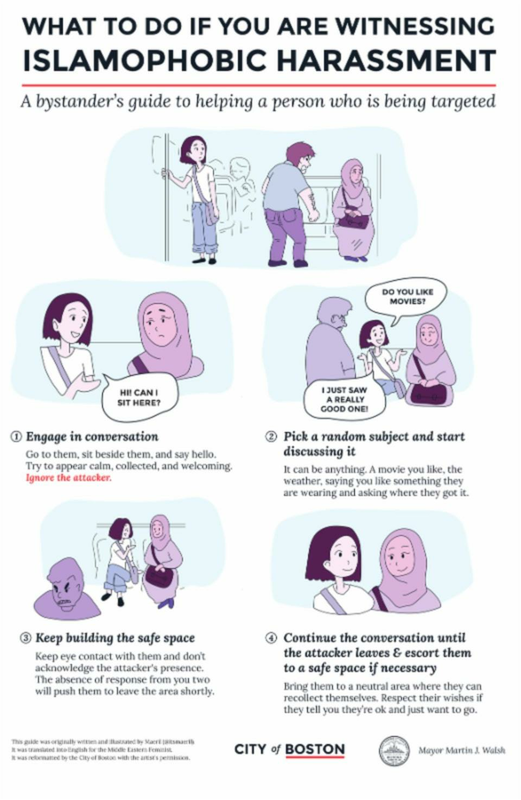 They give a step-by-step guide to diffusing situations where someone may be facing Islamophobia — or any other type of harassment — by encouraging bystanders to start up a conversation with those who are being targeted, and to ignore the person who is carrying out the harassment. The program comes after the city was approached by a woman whose sister had worked with San Francisco to have versions of the poster installed throughout their public transportation system. The city then approached the artist to adapt her design for use in Boston. This isn’t the first time Walsh and the city have tried to publicly welcome people of minority backgrounds or beliefs. In January, he lambasted President Trump’s threats to pull federal funding to sanctuary cities, pledging to shelter undocumented immigrants at City Hall as a last resort. He’s also visited local mosques to speak with residents and to deliver a passionate defense of religious diversity in the city.